There is something to discover at every turn and corner of the Brocka, Bernal, and the City exhibit mounted by the College of St. Benilde as part of the celebration of the centennial of Philippine cinema. This year’s itinerary started with a wreath laying ceremony at the Rizal Monument in Manila followed by beach trips to Batangas and Palawan. Amidst the rebuilding of Marawi more than a year after the devastating siege that leveled the once highly urbanized city, the needs of residents are changing. Adding a touch of whimsy and romance to an ordinary day is the sparkle that cousins Amanda LuYm and Cacay Moras offer with their passion project, jewelry line All That Glitters. Outside Jean Gosingco’s condominium unit, a doormat with a pig design is a hint of what’s inside. The recently-concluded Singapore Media Festival (SMF) – now on its fifth year – was abuzz with connections and collaborations being made across nations and across media platforms. AirAsia recently launched flights to Laguindingan International Airport in Cagayan de Oro from Manila (two flights daily), Cebu (daily), Clark (four flights weekly) and Iloilo (three flights weekly). 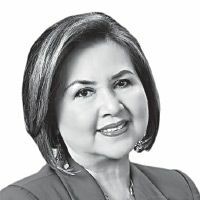 For Gloria “Golly” Estenzo-Ramos, it was environmental law that made her practice more meaningful. The Museo Pambata, which has become an icon in every Filipino’s childhood through the years, has been undergoing several changes as it continues to welcome younger and younger visitors. In her hotel uniform and pulled-back hair dyed magenta at the ends, 25-year-old Rebecca Marie Abigail Lee – call her Abi – can easily be mistaken for a hotel intern. ow on his second season as assistant conductor of the Hong Kong Philharmonic, ABS-CBN Philharmonic Orchestra conductor and music director Gerard Salonga has been making musical waves both here and abroad.